About how many yards/meters of yarn does it use? It's a really awesome looking pattern, I gotta make sure I have enough of the yarn I want to use. Congrats on writing a pattern! Thank you! :) It's a little difficult for me to say exactly how much because I used a stash yarn (leftover from a 6 oz/315 yard skein)So I know it was definitely less than 150 yards because there was less than half the skein in my stash, plus I ended up having some left. I'm sorry I didn't track it better, I didn't think the hat would turn out as good as it did. I do plan on making another very soon (just waiting on an order of yarn) so I will update with proper yardage. Love it. I have to try this. Will go up a hook size because I do crochet tight. Thank you. I'm having a bit of an issue with part when the single crochet comes in. Do I sc in every chain space as well as every stitch? I got up to the single crochet decrease and the opening of my hat is so small that.. it would probably only fit a baby haha. I'm not sure what part I messed up on! Yes you do sc in every chain space and every (top of dc) stitch. When you work the decrease you work 1 sc2tog and then sc in the next 13 stitches and then work another sc2tog then sc in the next 13 stitches......and so on. You might have possible miscounted maybe..? I know I have a lot of trouble then it comes to counting a bunch of stitches I usually lose track. Also this pattern is meant for yarns that have a bit of stretch so if you're using a stiff or cotton yarn it will affect it a bit. 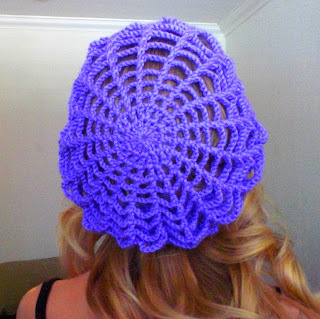 I made a chain mesh hat for my sister a few years ago but I haven't been able to find the pattern again. Thanks for posting this pattern. It's even better than the chain mesh one. Me again. Just wanted you to know that I started making this hat and decided to do a little detouring. Instead of doing a dc in the dc, I am doing a bpdc (back post double crochet). It gives it a cute little ridge around the outside of each row. Awesome! I would love to see it! 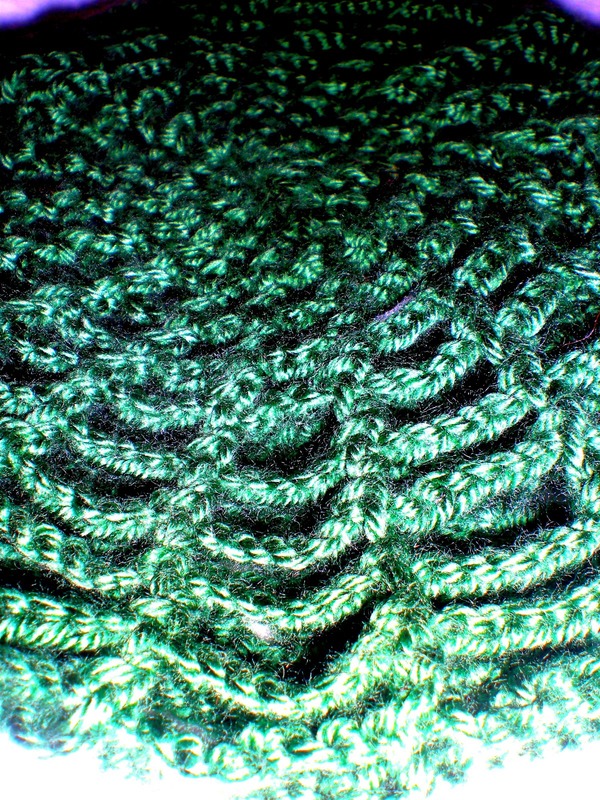 If you have the chance would you mind putting the picture up on the Ravelry project page once your done? I tried fpdc when I first was making the pattern but I didn't even think of doing bpdc! Alright, that's definitely where I messed up then because I only did a sc in the stitches, not in the chain spaces. I finally have time this weekend to fix it, thank you for being so prompt with a reply! On the beginning of the decrease round, are we supposed to sc in the same stitch as the beginning ch 1 or skip it? Thanks for this great pattern! I made one for myself, and I've posted pictures on Ravelry and on my blog at http://athenahandmade.blogspot.com/2012/07/summer-hippy-hat.html with a link back here. Thanks again! Instead of single crocheting and decreasing in the same row, my first row of single crochets were straight with no decreasing. I started single crocheting 2 together when I was done with the first row. I think it made that transition a little easier. 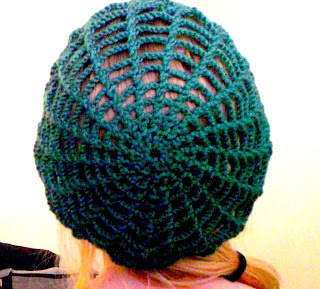 I made the spider web slouchy hat using Joann's Sensations in black...and it is lovely! 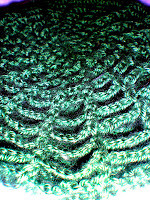 Great pattern..and I will use it again! A little confused at the beginning... do you have any pictures of your first 2-4 rows of crochet? Could you please tell me what sc2tog mean. Thank you! I need to wear hats or hairnets at my new job as a cake decorator. I'm thinkin' hats are the best of those options LOL This one looks like it will be cute but light enough that my head won't roast :) Thanks again! You say, crochet "into the top" of the dc from previous row. Do you mean in the front loop only? or back loop only? I am also confused about this. can someone who has done it clarify? You start out with 12 DC in the ring then in the second step you increase to 18. You DC into the same st 6 times totaling up to 18 sections. just found this pattern and I don't understand the 1st of it. I guess I don't know how to make an adjustable ring. Does it mean to make a ring out of the 1st ch 3? After that I think I got it. You can make the standard chain ring and it will work as well but it leaves a gap compared to the magic ring. I advise you to lookup how to do the magic ring. An adjustable loop is also called the "Magic Loop", look it up on the net. I love this pattern and it works up quickly and takes less than a skein of worsted wt yarn. I had to make 2 extra increase chain rows to fit family with "Big" hair. I also adjusted the finishing rows of sc to fit. The 2nd row always throws me even after making a couple of hats. It would be easier to read the increase row something like this, *dbl, ch1, ( dbl, ch, dbl) in same st, ch1* around. Thanks for the free pattern, I luv it! Thanks for the feedback. I had only been doing crochet for a few month when I wrote this so I wasn't able to put it in the easiest of term yet. You are very welcome to sell any item to make using any of my patterns. All I ask is that you please put a small credit link to my blog. Thanks!! I love this hat! Worked it up last night in About 2 hours. I did a back post stich on the dc and it gives it a little different look. Took about half off a 4.5oz ball for those wondering how much yarn it takes, used a med weight 4ply loops and threads impeccable. I made this hat pattern with added black plastic spiders as part of a halloween costume. I love this pattern and will be crocheting more in cool spring/summer colors for my nieces to wear. Thank you for a simple, yet elegant free pattern! Do you have this pattern in printable form? When printing from the website it comes out so light and small it is not readable. Would like to carry it with me. Thank you. I made this and I loved it! However it was a tad large even for my large noggin. How can I make it smaller? Use an F hook? Remove rows? I suggest using a smaller hook or chaining a little tighter. Best of luck! I love this hat but this pattern ends up with a really small band for your head! I went up to 10 chains and decreased down to about 6 to give it a little extra slouch. I just kind of wung it with the band size since my head is larger. When doing sc2tog, just do as many as you need to decrease enough to fit around your head. Thanks. It is great to read about this blog. It had been an amazing experience to go to this amazing site along with investigate posts along with subject matter. You can "work even" which means repeating the row right before the decrease until you get closer to your desired length. Best of luck! Glad you enjoyed the pattern! Thanks! I am just learning to crochet and would love it if you could post a how-to video to follow along! Please, please, please?! I'm confused right now. This is exactly what I would like to make for the summer but the instructions aren't by row except for the magic circle of dc's. I'm used to rounds to be in by rows and then it's more accurate when to start decreasing and what row the band should start on. Hope you're still active here. Is there anyway for you to rewrite or give a number of rows the decrease starts and what row the band should start on? Thank you in advnace. Do you skip a st when you *dc, chain 2* ? You skip to the next dc on the previous row for the spider web effect. It's always dc-on-dc. This pattern was awesome! Thanks so much for sharing it. Your post has motivated me to find out how to make my own patterns so thanks for that! It turned out lovely and was easily one of my favorite things that I created as a beginner. Thanks so much. Love this, but I learn so much better with visual instructions, do You have a video of the hat in the making,, I am just not getting it from written instructions.